Republican People’s Party (CHP), Kemal Kılıçdaroğlu, opposition party leader to the ruling Justice and Development Party (AK) is not criticizing the radical Muslims that have control of Turkey. One reason that Kılıçdaroğlu is being careful to not criticize the Operation is that critics get arrested. The Interior Ministry said on Monday, the 29th, a total of 311 people had been held for “spreading terrorist propaganda” on social media in the last 10 days. Detainees have included politicians, journalists and activists. On the 28th, President Erdogan accused doctors who opposed the campaign of betrayal. Turkish authorities warned they would prosecute anyone opposing, criticizing or misrepresenting the incursion in northern Syria. The arrests show that the government is serious about suppressing criticism. CNN-TURK is the propaganda arm of the Erdogan government and continue to spew optimistic rhetoric about Turkish attacks on Kurds who did not attack or threaten Turkey -- referred to as "terrorists". 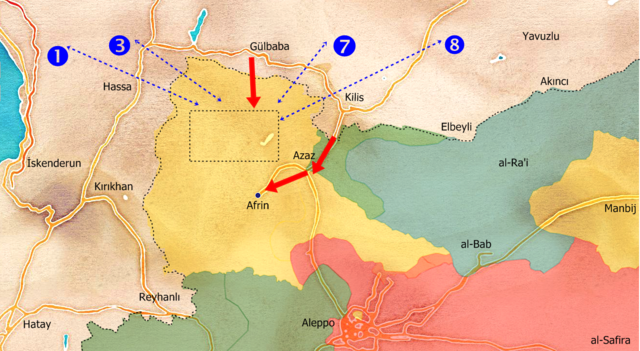 Eleven days into the operation, Turkish forces and Turkish proxy forces have not captured Afrin. On the 29th, Syrian Kurdish fighters mounted a counter-attack to retake the hill between Afrin and Azaz that the Turks obtained disputed control over on Sunday. The Turks scheduled a press session with CNN-TURK to announce victory in regard taking the hill for the 29th, but canceled it because the hill was not secure. The Syrian Kurds in Afrin are negotiating terms ceding control to Damascus. A spokesman told Izvestiya on the 29th, "We are ready to give up the city and the areas surrounding it, but we must receive guarantees that our interests will not suffer by doing so." Since 22 January, the Russians have been advising the Syrian Kurds to transfer control of the city and its environs to Damascus in order to limit the Turkish invasion. Russia has been negotiating the terms of a compromise on behalf of the Syrian government. The Syrian defense ministry spokesman said the Syrian army is prepared to march into Afrin if ordered. That would present the Turks with another complication to President Erdogan’s quick operation against "terrorists" in northern Syria. The Russians are engaged in a balancing act with the Kurds, similar to the US, but on a smaller scale. The Russians oppose Kurdish autonomy, but also protected them the Kurds against the Turks during Operation Euphrates Shield. The Russian solution is for the Kurds to work with the Syrian government and under its protection, rather than try to negotiate a separate status. Killing Kurds for fun and profit (a Turkish national pastime that runs back well over a century) has proved to be much more difficult than the Turks anticipated in Syria primarily because the Kurds were trained and armed by the US. The US provided DEFENSIVE weapons that are effective against the combined arm mix that the Turks are throwing at them. 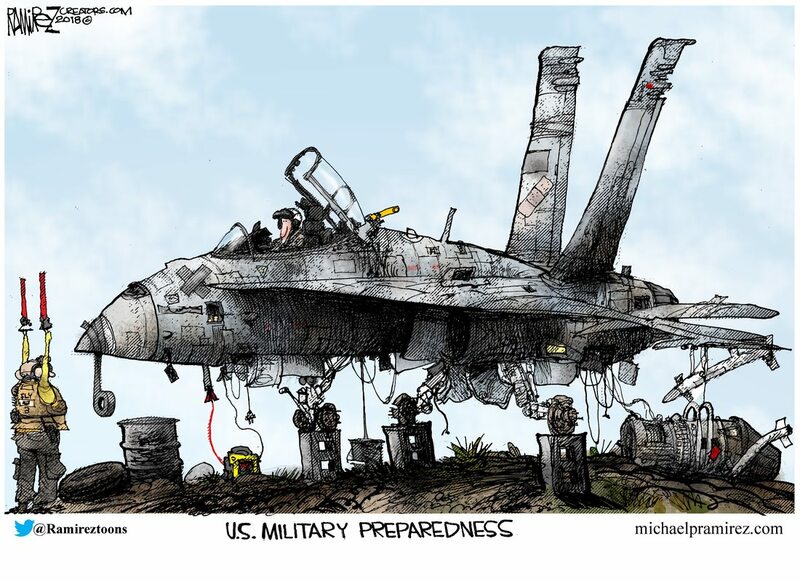 The US Military should be second to none, but during the dark, dismal, years of Obamanation, we saw things slide. Social justice overtook war fighting as the military's priority and we focused a lot of energy on stopping global warming. Things weren't repaired and vital military missions kept our ships at sea far longer than they should have been. Retention of personnel became an issue when the focus shifted from welfare and morale to transgender matters. He said unto them, An enemy hath done this. Barack Obama spent the eight years of his presidency preaching that America was a nation in decline. He bowed and scraped and acted the fool. Nobody outside the US respected him and many in the US didn't either. The military's decline reflected the Obama Doctrine. Those sad and spare years have been replaced by the Trump Presidency and we have a president who is optimistic about what we can do - but he has said that he inherited a mess. Who can disagree with him. However it will take time to fix the damage that was done. I had an opportunity to spend some time in Great Britain last August and see the decline (and rot) in Her Majesty's Navy. They've kept up special forces and the SAS is still capable, but it's a long road back. And with their emphasis on recruiting Muslims, transgenders and deviates into the ranks, it will tend to push the straight, normal folks out and their capacity to recruit will decline farther. The whole "it's good to be able to cry," campaign (we can't get the best so we'll settle for the rest) has never been a good idea when it comes to war fighting. October 2016 - YOU WERE THERE. […] For those who control the levers of power in Washington, and for the global special interests they partner with, our campaign represents an existential threat. […] This is not simply another 4-year election. This is a crossroads in the history of our civilization that will determine whether or not We The People reclaim control over our government. The political establishment that is trying everything to stop us, is the same group responsible for our disastrous trade deals, massive illegal immigration, and economic and foreign policies that have bled this country dry. The political establishment has brought about the destruction of our factories and our jobs, as they flee to Mexico, China and other countries throughout the world. Our just-announced jobs numbers are anemic, and our gross domestic product, or GDP, is barely above one percent. Workers in the United States, are making less than they were almost 20 years ago – and yet they are working harder. It’s a global power structure that is responsible for the economic decisions that have robbed our working class, stripped our country of its wealth, and put that money into the pockets of a handful of large corporations and political entities. […] This is a struggle for the survival of our nation. This election will determine whether we are a free nation, or whether we have only the illusion of Democracy but are in fact controlled by a small handful of global special interests rigging the system. This is not just conspiracy but reality, and you and I know it. […] They control the Department of Justice, and they even clandestinely meet with the Attorney General of the United States – in the back of her airplane, while on the runway – for 39 minutes – to most likely discuss her reappointment in a Clinton Administration just prior to the Attorney General making a decision over whether or not to prosecute Hillary Clinton.